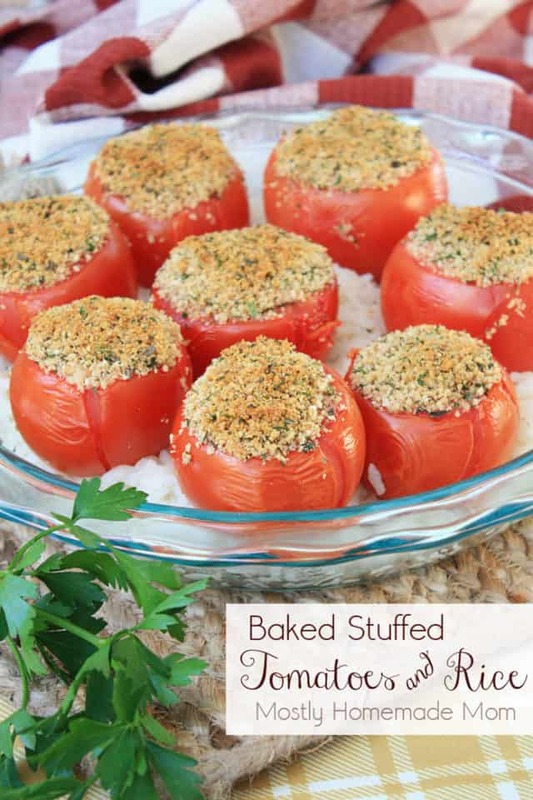 This Stuffed Tomatoes and Rice recipe is a great holiday dinner side dish! 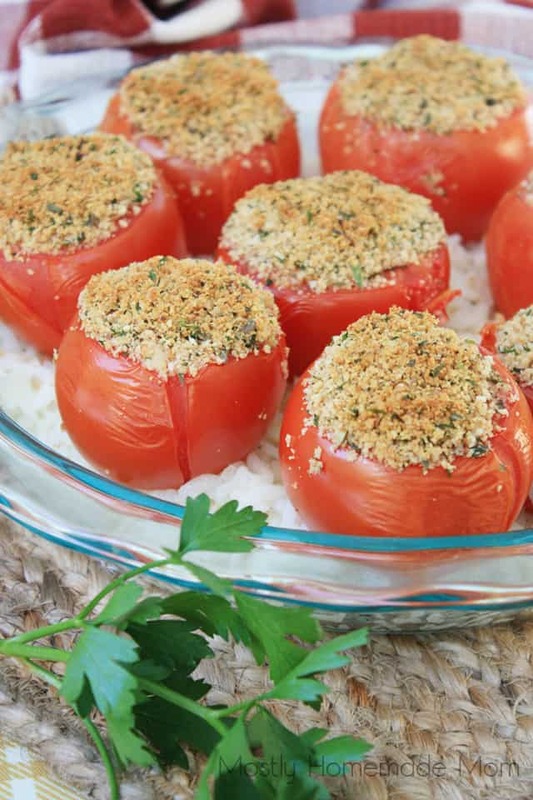 Whole juicy tomatoes stuffed with bread crumbs, Parmesan cheese, and seasonings, and baked until hot – perfect along with turkey or ham! 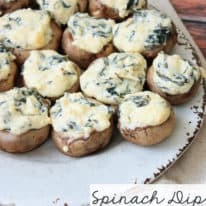 I absolutely love recipes like this one that I’m sharing with you today. It’s an incredible, fresh, and flavorful meal during the busy week. It can also be a beautiful and impressive side dish for a big holiday dinner. The seasonings and flavors really meld together on their own, or really with any main dish as well. If you’ve never roasted whole tomatoes in the oven, you really must try it. This time of the year, many of us are no longer able to enjoy garden-grown tomatoes, unfortunately, with the cooler fall weather here. 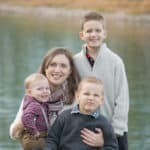 We actually had frost last night and will again tonight. I was feverishly picking all of our tomatoes, even the green ones, to finish ripening on the counter. The plants, however, are now gone, and we’re ready to start planning for big dinners, parties, and the holidays. I think we can all agree that store-bought tomatoes have a much milder flavor than home-grown, which is why I highly recommend roasting or baking tomatoes whole, like in this recipe. The high oven temperature brings out the juices of the tomato. 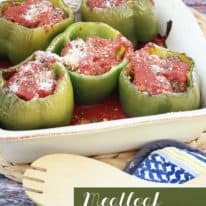 The bread crumb filling here combines with those warm, tangy tomato juices and the flavors just come together so nicely. 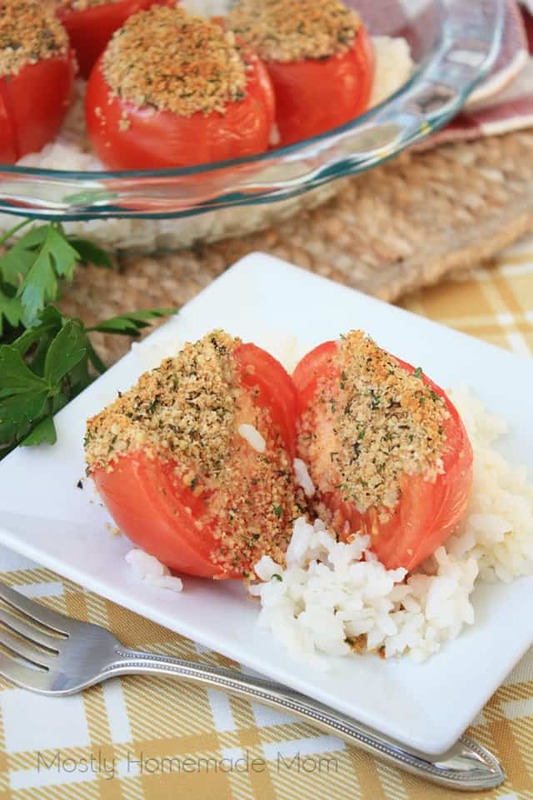 This Stuffed Tomatoes and Rice recipe is a great holiday dinner side dish! 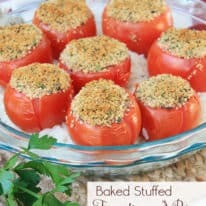 Whole juicy tomatoes stuffed with bread crumbs, Parmesan cheese, and seasonings, and baked until hot - perfect along with turkey or ham! Cut the tops off of the tomatoes and scoop out about 2 - 3 spoonfuls of flesh. Place prepared tomatoes onto a cookie sheet and set aside. In a medium bowl, stir together Vigo Italian Style Seasoned Bread Crumbs, butter, cheese, and seasonings. Spoon mixture into tomatoes evenly, packing down to fill them as much as possible. 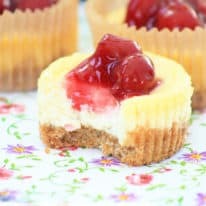 Bake at 350 degrees for 25 minutes or until tomatoes are soft and juicy, and bread crumb mixture is golden brown. Spoon cooked rice into the bottom of a serving dish. Place cooked tomatoes over rice. 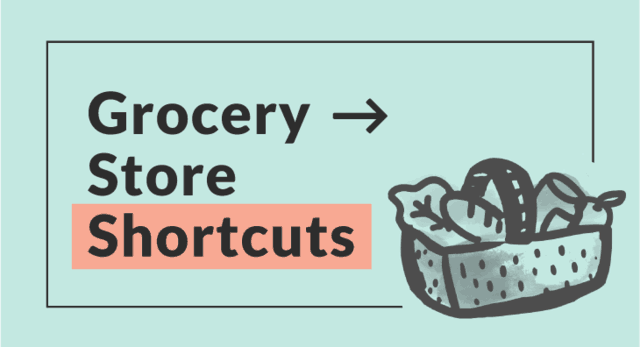 Serve immediately; refrigerate any leftovers. 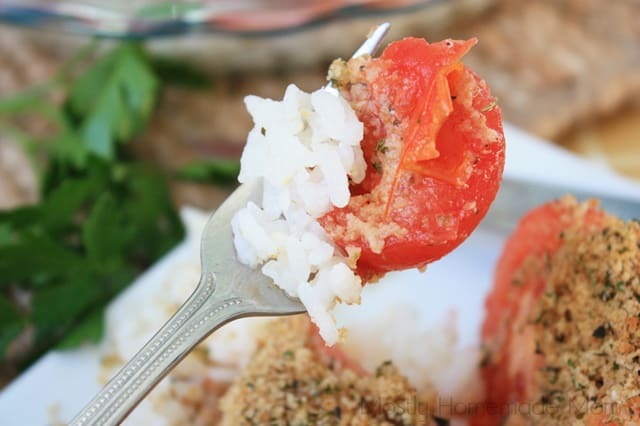 I really can’t even begin to tell you how flavorful these tomatoes are with the rice! 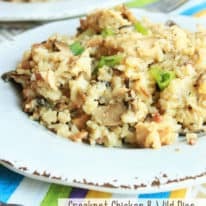 I definitely recommend doubling this recipe and making it to go along with your Thanksgiving or Christmas dinner feast. 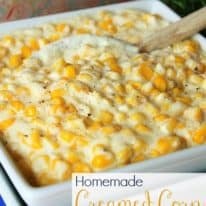 Your family will be so surprised and impressed with this dish! 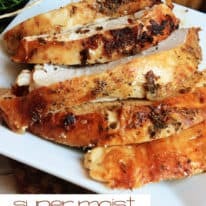 In this recipe, I used my favorite Vigo Italian Style Seasoned Bread Crumbs, which are the the only ones made in their own facility with imported Pecorino Romano Cheese and 11 different spices in the blend. These bread crumbs are so versatile – you can use them to add flavor and texture to any meal! Of course I also love Arborio Rice Boil-In-Bag which requires no measuring for perfectly portioned servings ready in only 14 – 16 minutes. 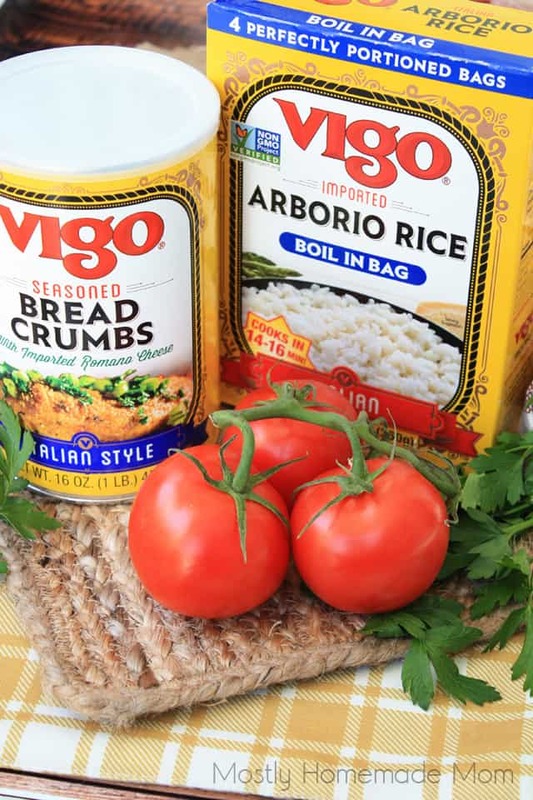 Not only is arborio rice wonderful in side dishes, but also as the base to your favorite one-bowl meal creation. Great in salads as well! Vigo was founded in 1947 by Antonino Alessi, and his sons are the co-presidents of the company – Tony Alessi Jr. and Alfred Alessi. They are trademarked in 24 countries and offer 800 items under both the Vigo and subsidiary Alessi brand. 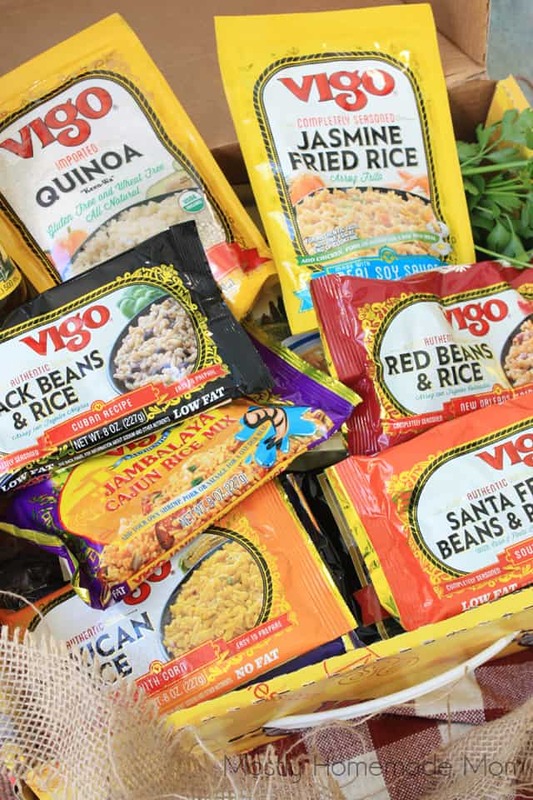 Vigo products are available at your local supermarket, or you can – Shop Vigo’s online store.